Home security and preventing door kick ins is always a hot topic. ArmorConcept is a company that makes door reinforcement kits that will help prevent those types of incidents from occurring. When I say prevent, I mean literally it prevents it! If you take a standard wooden door, you will literally kick a hole through the door before you are able to get into that. ArmorConcept has been around longer than anybody doing this type of home protection. The premise of that is distributing force. If you take a well-placed kick on a door by somebody, weather that somebody knows what they’re doing and donkey kicks it vs somebody that tries to do the front flying Chuck Norris attack in your door, what is going to give first is the deadbolt location where it actually meets the door frame. That wood is going to splinter and give way right there because all that’s holding your door on is that piece of metal that goes into the door frame. There’s a couple of screws and the plate that is in the frame and then there’s the deadbolt that goes through there. So the lock mechanism where the deadbolt is typically isn’t going to give way on the door side, it’s going to be on the frame side. It’ll splinter and door is kicked in that way. That is most commonly in residential door frames. In commercial buildings, it’s not as big of a concern because most of those are steel door frames that are a little harder to get through. When it comes to home security, it’s always better to have a steel door than a wooden door. It will hold a lot better against attacks. Something that happens on the commercial side, and sometimes with steel doors, is that you get prying. People will try to pry with screwdrivers or something like that into the actual lock mechanism and disengage it that way. ArmorConcepts makes a product called a pry shield. If you can imagine the old credit card trick where you can disengage the lock with nothing more than a credit card, that’s the kind of thing that pry shield prevents. It gets put onto the outside of the door with some screws that are ingenious. They are flat head screws. The clockwise direction which would tighten the screw allows you to get a flat head screwdriver and actually get tension on that to twist the screw in. But if you try to reverse the screw, it slips and that’s based on the design of the screw. Even though this pry shield is installed on the outside of the door, somebody still wouldn’t be able to easily come up with a screwdriver and just take the pry shield off. It would take some work. I’m not saying it’s impossible. But keep in mind that all security is just buying time. 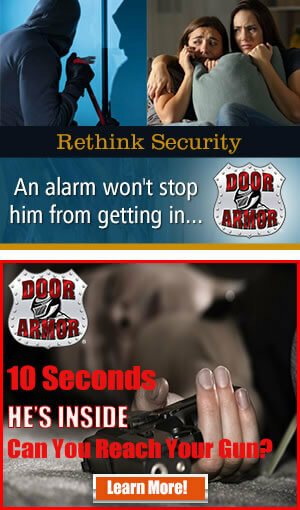 You’re trying to slow down the attack or slow down the intruder of getting into your home. The more things you can do to enhance the security in that form and fashion will slow them down and buy you time to either defend yourself or call the police or do both. That’s kind of the gist of the pry shield. Let’s move to what they call Jamb Shield. This gets installed on the frame side of the door. Where the deadbolt comes through and makes contact with the frame, that’s what these little pieces are there for. You can twist these and open them up and pop those out exactly where your deadbolt comes through it. 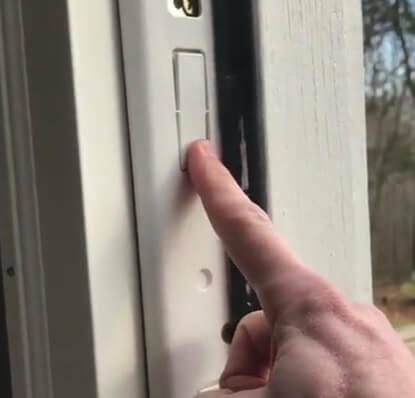 One problem that I had with things like this in the past is that typically the door sensor or the contact for an alarm system is something you have to kind of work your way around with these plates. So you wind up having to get a bigger size drill bit and drilling through these to open up that hole where the actual contact is coming from. If it’s in that door side. Sometimes they come from the top and that’s perfect, that’s even better when your alarm contact is on the top. So if you have the choice of figuring out where to put an alarm contact, the upper location in a door is always better because it’s not on the frame side. With the Jamb Shield, you do not have that problem. You just remove those little pieces. It’s all about the distribution of force. So instead of that force occurring right on the deadbolt and the latch itself, with this plate, those two pieces, both the deadbolt and the other lock, are engaging with the big steel plate, distributing the force along the entire dimension of this plate. That is why it is so long. Additionally, there are huge long screws. If you’ve ever taken the screws out of the door frame and had to replace your door hardware, you know those screws are pretty short, less than 2 inches a piece. These are great because they’re super long. Not only do they are long to engage with the plate in the door frame, but they’re also meant to replace the screws from the hinge side. That is something you have to worry about too. Well-placed kick against the hinges can also throw a door off too. If you’ve ever replaced hinges on a door, you know those screws are pretty small too. The screws that come in ArmorConcetps kit will help increase the security of your hinge side because they’re so long. What I like about ArmorConcepts is that they include a couple of different things too. It’s not just the plate. 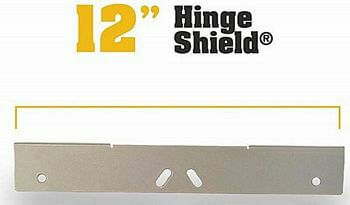 They also include these Hinge Shields. The way these work is they actually fit over the two of the three or four hinges on your door. You pull out the middle screws in those hinges and you slap on the hinge plate, put the screws back in the actual hinge and then adding additional screws on the top and bottom of the hinge shield. If you can think of that distribution of force again, you’re doing the same thing on the hinge side with these plates too. Then they’ve got these things called Door Shields. 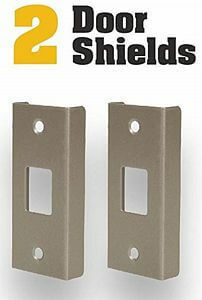 Over the deadbolt part of your door and on the latch side of the door, for both of those locations they include these Door Shields. You can put those on to further reinforce your door. It’s really a complete package. These things are very powerful. I would call them a mandatory upgrade in any home if you’re considering home security because getting doors kick-ins is really something you need to pay attention to. 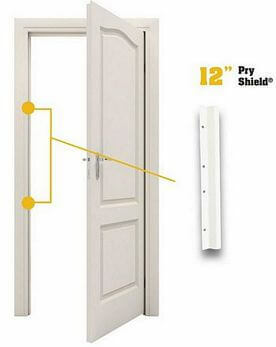 What I also like about ArmorConcepts is that they protect other door configurations. They secure things like the back patio sliding door. They have kit for that too which is super cool. They also offer a double door or French door security. If you have a front door on your home that has two doors, that’s actually one of the most insecure methods for your front door. Think about it. 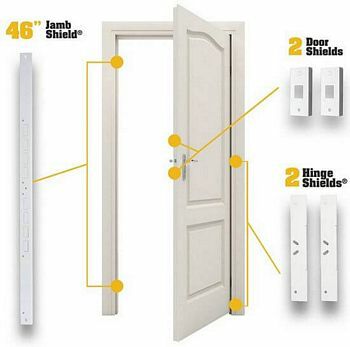 All you have is the deadbolt and the latch but then on the bottom, the only thing that is securing that second door to the bottom is typically some type of pin in the top and bottom of your door frame itself and that’s super easy to kick right through. ArmorConcepts was the first company that I’ve come across that has security measures for those doors. They also offer security for sidelight doors. It is a front door that has a pane of glass on one side. Those things are notorious for people just breaking up that window and coming around and opening your door, which is super easy to do. So ArmorConcepts has protection for exterior doors, interior doors, sliding glass doors, double French doors, sidelight doors and prying protection.